I’ve been given everything from cocktails and Banh Mi sandwiches to plots of land and safari animals. That’s all virtual, of course, and it all happens on Facebook. My social network is apparently very generous (when they’re not “poking” me or Farmville-spamming me, that is). Facebook Gifts shouldn’t surprise anyone who has been following the company. It has been infamously trying to diversify its monetization strategy beyond mere ads, particularly after the financial kick-in-the-pants known as its botched IPO. And social media pundits probably knew something was up last May, when it acquired San Francisco–based startup Karma, the developer of the gift-giving application powering this newfound profit pipeline. Whether it actually will be profitable, however, is anyone’s guess. But there’s definitely potential here. The network already offers alerts for upcoming friends’ birthdays, so it makes sense to give users a way to buy and send presents from within the same space. And if the retail partners are willing to reduce their own margin to accommodate Facebook’s slice — so that customers aren’t actually paying more for the same gifts they could get on, say, Amazon — then that would lock down both convenience and price points. The only potential downside happens when recipients are asked for their mailing addresses. A lot of people are already suspicious of Facebook and its privacy policies. Will they be willing to give up their home or work addresses to this organization, just for the promise of sunglasses or cupcakes? We’ll have to wait and see. 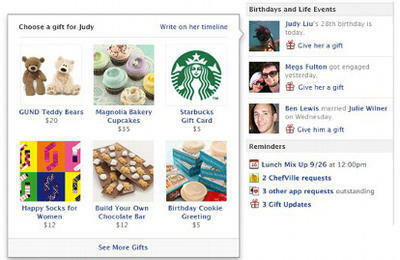 The initial rollout for the new Facebook Gifts has only just begun in the U.S.